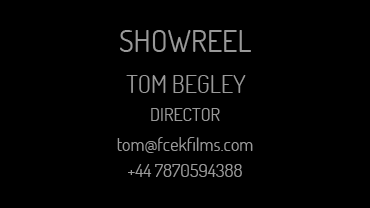 Welcome to the site of award winning director Tom Begley. Tom originally trained as an actor many moons ago and spent a great deal of time working his way into the industry, with a couple of commercials, lots of short films and a few small feature parts thrown in. Tom then progressed onto directing theatre and directed a number of successful plays over five years in theatres all over the London fringe, with 2 tours of the UK and Ireland. In the meantime, Tom was getting interested in film and had started to write and direct short films - some of which should never have seen the light of day - but others showed promise. Tom then decided to learn more about the technical side of directing, and so took a directing course at the Met Film School where, under the tutelage of some very experienced mentors, he learned quite a bit and filled in some gaps. Since then, Tom has gone on to win an award at the Saboath Milan International Film Festival in 2011. That particular film is still being shown at women's refuges all over Italy. Tom has directed many short films, a feature film, music videos and test commercials and is currently in the hot seat to direct a low budget feature in 2014. Tom works and collaborates with some very talented people, who like himself are waiting for a break. Tom has access to crew, equipment, actors and post production should anyone be looking to get their project off the ground. In addition, and having worked on low and no budget projects, Tom can certainly help most people (if not everyone) who contact him regarding a project, within reason of course! Tom says "People do need to be realistic about their expectations. People that know me and have worked with me in the past will confirm that I have a "no nonsense" attitude to work and like to get a job done to the best of my ability. I also firmly believe in collaborating in order to get the best result from every project. Lastly no project is too small or too big for that matter and I have a very loyal and talented crew around me who, like myself, want to succeed and get the best from every project." Tom has just finished shooting the latest Tom Reidy short script "123" and is currently in post post production with this. The short should be completed and ready for the film festival circuit by March this year. He is hoping to follow on from the success of the last Tom Reidy film "My Family" which has been very successful in both LA and NY. Tom is also working with the very talented writer Jamie Hickey on funding their script about old IRA legend Sean Mac Eoin from county Longford Ireland. All being well and subject to funding the film should be shot later this year at various locations in and around Co Longford itself.